Over 80 years ago the predecessor to Fine Gael, Cumann na nGaedheal, held its inaugural meeting in the Mansion House in Dublin. The meeting launched a political party that found itself in the rather unusual position, where it was a Government first and a political party second. The Cumann na nGaelheal government having being formed in August 1922 some nine months before the party was established. It’s also quite remarkable that for ten years, 1922 to 1932, Cumann na nGaedheal was in government, playing such a pivotal role in the establishment of Irish Democracy, yet very little has been written about the period and its leading characters. And that which has been written paints, in my view, an unfair and unsympathetic historiography of the period. This afternoon, with your permission, I would like to debate the Republican themes that were evident in that first and second government and deal with this in some detail. I would also like to make some brief remarks on the period from 1932 to the present, in terms of Fine Gael’s general history and the Republican themes, if any, that were in existence. In looking at the issue of Fine Gael and Republicanism, I hope to evaluate the role of that first government, which may help us to see some of the values that are at the centre of what the modern Fine Gael party stands for. Many in this country fail to recognise just how Republican Fine Gael has been since the party was first formed. To those who have this view I respectively suggest that now is the time to find out a little more about the role of Fine Gael. Of course the other problem here, is the fact that there are as many understandings of the term Republicanism, as there are Republicans in Ireland. Some describe themselves as Red, Green, Pink or even Blue. Indeed, there are even those who might well describe themselves as, part Republican part other. We need to be aware of this. We meet at a time of immense contemporary importance for the search for peace on this Island. One of the corner stones of Republicanism is the notion of self-determination. I think it can be argued quite convincingly that the purest form of self-determination ever given by the Irish people was their support for the Good Friday Agreement in 1998. Despite this democratic verdict, we still see armed groups some 10 years after the initial ceasefire attempting to subvert the self-determination of the Irish people, as they have to date refused to disarm in a manor, which would have brought confidence to the political process and was in keeping with the Agreement. I hope that the gun will finally be removed from Irish politics so that reconciliation in this most sectarian of conflicts can be brought to an end. The real problem with using a term like republicanism is that for every person you meet, I expect you will find a separate understanding. Unfortunately, in Ireland the term has been bandied about since the days of William Drennan who in the late 1790s wrote the original prospectus of the United Irishmen. And as we know the ideals of the United Irishmen, were as much devoted to the notion of reform for the purposes of economic freedom as they were towards the rights of man. The march towards 1798 cannot be separated from the Irish reaction to the French Revolution and the demand, particularly, from the merchant middle classes, for economic freedom and fairness from Britain. So what can we understand from early Republicanism in Ireland in so far as any date or time can be put on the establishment of such a movement? Originally the demands of the Belfast Clubs, established to mark the celebration of Bastille day in 1791 had understandably modest objectives. Ideas such as universal male suffrage, catholic emancipation, a secret ballot, and the payment of MPs. This was all a very long way from Paine’s “ The Rights of Man”. But it did highlight the influence, albeit in modest terms, of the French Revolution and the demand for representation amongst men of small property. In my view the most powerful influence behind that small movement of radical thinkers in the 1790’s was the belief in an Ireland that was non-sectarian. 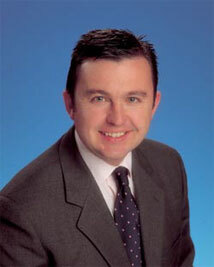 Tone’s inspirational claim that Ireland could be a place for “Catholic, Protestant and dissenter alike”, really was radical when one considers that in the previous decade the sectarian feuding between the Catholic defenders and the Peep O’Day Boys had reached a fever pitch in many counties of Ulster. Despite the declaration of the Republic sought by the radicals at the end of the 1790’s, the net effect in terms of the relationship between Britain and Ireland was of course a legislative union that occurred with the Act of Union. From 1800 on the struggle for Independence dominates the course of Irish history. And within that movement, of course a wide variety of political views are expressed right up until the time of Independence itself and indeed afterwards. In my view the term Republicanism and the Independence movement became regarded as the same thing from 1801 right up until the present. Too often the term Republican is used to explain away a person who is really nothing more or less then a neo-nationalist in the European sense of that phrase. Nationalism and Republicanism have become interchangeable in modern political discourse and there is a need to reclaim the real values that are central to republicanism. Another contradiction is the fact that Sinn Fein today is regarded as the Republican Party, with their cousins in Fianna Fail only a lesser shade of Republican green. The founder of Sinn Fein, Arthur Griffith, famously once proposed that a system of dual monarchy between Britain and Ireland be established. That a Republican could believe in the existence of a monarch, clearly demonstrates the healthy contradictions in our history. Most northern Protestants would not regard themselves as Republicans. Yet, as we saw earlier, the bedrock of support for the United Irishmen came from the radical Presbyterian tradition. Once again, their history would seem to have been airbrushed from our collective understanding of the term Republicanism. Trying to extrapolate a precise and neat understanding of what we mean by the term Republicanism is in my view a futile exercise. I do not believe that Republicanism represents a coherent political manifesto of actions in every area of social and economic policy that are easily interchangeable from one state to the next. But, I believe passionately, that a number of well understood values are clearly Republican values both in their historical and contemporary application. The values that underpin our modern State with a rational legal system of government are inherently Republican values. The right of the people to determine their own government. Universal sufferage. Free speech. Rule by the majority. Respect and accommodation of minorities. Free and fair elections. The separation of powers between the executive and the courts. A written constitution. Civilian control over the army. The concept of Citizenship. These are in my view basic Republican values that mark out our system of government but do not constitute in themselves a coherent programme for government or an agreed set of policies that can be readily implemented. The Proclamation of 1916 was a revolutionary document that all Irish people could subscribe to. But as is so often the case, the devil is in the detail. Republican principles must be at the heart of all political parties in a Republic, however the real dividing point between parties, comes not from Republicanism, but whether a party is Socialist, Social Democratic, Conservative, liberal, Christian Democratic, Green or Nationalist in perspective. That is ultimately where the difference lies. The reality is that those who founded this state came as I said from various political and social backgrounds. It was clear that one thing above all else bound them together; the demand for Independence. Interestingly, Sinn Fein’s early aspirations were not for a one party state, but rather for a no party state. This had followed the idea that the “national movement”, as it were, was really an amalgamation of political independence and cultural reawakening as seen in the Cultural revival in early 1900s. D.P Moran’s view of an Ireland for the Irish seems to reflect this new national self-confidence even before the rising took place in 1916. My point is that there was always a real division amongst those who fought for our independence and the idea that one single agreed position on social issues was accepted, is a good deal wide of the mark. I would now like to look at the role played by Cumann na nGaedheal and later Fine Gael in the development of democracy in Ireland. Although some find it difficult to accept, many of the actions taken by our party during our short time in Government over the past 80 years are Republican in character and I think reflect deeper values that are sometimes ignored or deliberately misunderstood by alleged “commentators” and the like. The first thing to say about the Free State government was that they were working in the most difficult of times. Clearly the violent and bitter Civil War had left its mark on the entire country, as had the loss of both Griffith and Collins who were the natural leaders of the Free State. The great achievement from an early stage was the relative stability of the state, particularly from 1926 onwards. Europe at the time was a place where states were established today and were destroyed tomorrow. The map of Europe was constantly changing in the 1920s and 1930s. Ireland did not go the way of Spain, Italy or Germany that saw the rise of Fascism in the early 1900s. I think today that we are the third oldest state in Europe. Europe of the 1920s was dominated by an entire collapse of many once successful economies. High inflation, dodgy bank borrowings, economic instability were the order of the day and of course this culminated in the ultimate downturn of the world economy in 1929 with the Wall Street Collapse. In 1923, following the persuasion of the London Banking establishment, Irish Banks in effect gave the fledging state some time to turn the ship around with massive public borrowings. Unlike India or other countries where the British had left, the Free State had considerable annuities to pay to the British and massive outgoings; in effect no cheque was left on the mantelpiece on the way out. And despite all of this and the constant threat by the irregulars to the stability of the State, parliamentary democracy did take root at a very early stage. In my view the abiding success of that first government under the leadership of W.T.Cosgrave, was the immediate civilian control that was put on the Army. In any Republic Civilian Control of the Army, particularly one that had just come through a Civil War is essential in establishing the proper democratic control of the authority. Interestingly, this was something that was not achieved in the first Dail in 1919. 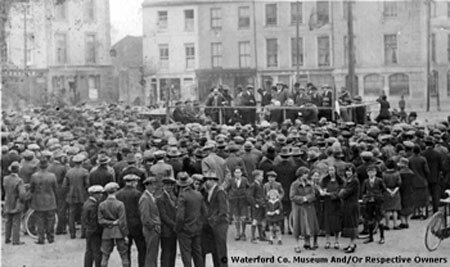 Civilian control of the Army, the establishment of An Garda Siochana in 1924 and the massive programme of demilitarisation, the army was half the size by the end of the 1920s as it was in 1922, greatly helped the normalisation of Irish society by the time Fianna Fail entered Government in 1932. And that of course was the great test. The entire apparatus of the State, just 10 years old at the time, quickly got behind De Velera and the new State had finally come of age. I think this achievement should not be overlooked, because as we have seen in South America and Africa, frequently where a new state is established, it is the failure to take arms out of the equation that ultimately undermines the state and its authority in the first place. And without over stressing the point, demilitarisation was not popular with the army because of expectations that followed the Civil War. In any Republic the concept of having a permanent independent civil authority that is loyal to whoever is in government is also important. The permanent Civil Service, which has served this country so well in over 80 years, has its roots in the establishment of the Civil Service Commission in 1924. This was a non-political, independent permanent government that would serve the elected government of the people. Here again there were great expectations after the civil war that people who were on the winning side would be looked after and that jobbery and patronage, such features of the Dublin Castle administrations, would continue with the Free State Government. Cosgrave made it abundantly clear this would not happen and a system of meritocracy in the appointment of government jobs became the order of the day. In the area of Foreign affairs, again the first government sought to use Dominion Status to achieve international recognition for Ireland. In fact the work of Ministers such as Desmond Fitzgerald brought about one of the most lasting changes to the Commonwealth, the Statute of Westminster in the early 1930s. But I believe that an area that has been completely forgotten about is the 1922 or the Constitution of the Irish Free State, as it was known. The Constitution, which in effect replaced the 1919 Constitution or the “Democratic Programme” of the first Dail, was described as “ the most revolutionary constitutional project in the political history of the two islands since the instruments of government of the Cromwellian period”. This quote came from Dr Kohn who wrote extensively on the subject of British Constitutional Affairs in the 1930s. And while many believed that the 1922 constitution did not go far enough, a simple reading of the document highlights straightforward and essential Republican characteristics. Article 2 declares “all powers of government and all authority legislative, executive and judicial in Ireland, are derived from the people”. It’s quite clear that the sovereignty of the people is central in the 1922 Constitution. The insistence on the provision for Referenda, the central role of our courts in making judicial reviews, the provision of Proportional Representation, as a means of inhibiting one party rule; all find clear expression in the Constitution. Various liberties and fundamental rights, here again classic Republican thinking, are to be found. Article 6 refers to personal liberty, reference is made in Article 7 to the inviolability of one’s dwelling, freedom of expression, freedom of assembly and of association, the right to vote, non retroactive penal laws, right to a fair trial, jury trial for serious offences; were all part of this new constitutional framework brought about by the first government. Those who argue that the Cosgrave governments were conservative, staid and lacked imagination, must at least recognise two positive social principles within the 1922 document. A commitment to free elementary education and a declaration that all natural resources of the country belonged to the State. There was no constitutional prohibition on Divorce nor indeed was there an attempt made to inhibit the freedom of women. This Constitution did not have the rather sectarian overtones that were evident in its successor. It was not a catholic constitution for a catholic people. In the words of the late Prof Basil Chubb, “it (the constitution) leaned to secular indifference”. Government from 1934 to the present. Despite our poor electoral performance in comparison to Fianna Fail’s, the party’s development during the period is interesting from the perspective of Republicanism. It was a Fine Gael led Government that in 1949 changed the Constitutional position of the Country in the passage of the Republic of Ireland Act. And while I do not intend to address in detail the achievements of each Fine Gael government, it is worth pointing out that the declaration of the Republic showed how correct Collins was when he described the Treaty as a “stepping stone”. However if students of Republicanism are trying to see how Fine Gael advocated egalitarian policies, they should look no further then the 1960s and the Just society policy of Declan Costello. It is true that tension was evident in the party as a result of what many thought to be a shift in policy. This debate was taking place at a time of considerable international debate and naturally the division in the party was typified as a struggle between Conservatives and modernists. There are two other developments I would like to briefly discuss. One is our attitude to Northern Ireland policy, which was greatly transformed in the late 1960s and the other relates to the issue of Constitutional change, and how we tried to create a more pluralist Constitution in the 1980s. Too often in the past the problem of Northern Ireland was debated in the context of territory. Northern Ireland was seen as part of the national territory and that the only real solution was immediate re unification with the entire island and a withdrawal of “the British presence”. Unfortunately, too few people recognised that the British presence in Ireland was the 1.5 million Unionists who lived in the north east of Ireland. In a document “Towards a new Ireland” written by Garret Fitzgerald and Paddy Harte, Fine Gael defined the problem in terms of recognising the reality of partician and attempting to engage with the Unionist population on the issues that really mattered. Fianna Fail in the Downing Street Declaration finally embraced the principle of consent, which Fine Gael spoke about in the 1960s. It was the cornerstone to a new agreement, which finally left the issue of national territory to one side while reconciliation between Unionist and Nationalist was to be given a chance. I argue that the role played by Fine Gael, some twenty years before the Good Friday Agreement, laid the foundations to a new understanding between North and South. If you are serious about reaching out to all of the traditions on the Island, it follows that the primary document of fundamental rights to all citizens, a written constitution, must reflect this. Garret Fitzgerald’s attempt to launch a Constitutional Crusade, in attempting to make the Republic more of a Republic, met with fierce resistance throughout the 1980s. Yet the logic of the position was that a new Republic, encompassing all of the Traditions that Tone spoke about some two hundred years previously, needed a new Constitution. The struggle to create a more pluralist, dare I say Republican, Constitution, was not only an attempt to modernise our society, but was also designed to recognise the fact that Ireland was a broader culture then just Catholic Nationalism. I said earlier that Republicanism for me gives very definite rules of engagement in terms of the basic rights that citizens are entitled to within a Republic. The notion of the Republic still fills me with a tremendous sense of responsibility. This idea, which I feel strongly about, that you are buying into a system of rights where people know that the State is theirs that it truly belongs to them and that citizenship, really matters. Too often we take our citizenship for granted. That is why, I believe its really important that the ideals of the Republic are understood and that as citizens, we accept our responsibilities in building a better State. How stands our Republic today? Despite the rampant individualism that follows all positive economic cycles, the State can point to considerable success in extending constitutional and judicial rights to people. And where there is a contest as to the performance of the State in dealing with the Citizen, new powers, for example in the office of the Ombudsman, have been put in place. A healthy tension exists between the power of the executive and the Courts, and this has ensured that quite a sophisticated system of checks and balances exists, all of which helps the citizen to obtain his or her rights. But by far the most corrosive problem we face in the modern Republic is a complete disengagement from the body politic. This has been helped by an understandable lack of trust between the citizen and the politician as too often politicians have let themselves and their respective parties down. It is, in my view, becoming more difficult to pass on the ideals of the Republic, where people want to opt out and disengage from mainstream politics. We face a huge struggle here. 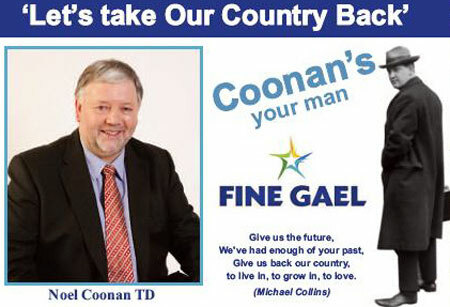 In the life and times of Michael Collins we find everything that is currently lacking from Irish Politics. Courage, patriotism, selflessness and a clear determination to take a position on principle. General Collins life was a sacrafice for Ireland. His memory belongs not just to one political tradition but to all traditions. In thinking about history and politics , and the penetrating role that Collins played, we in Fine Gael must use all our talents to do for Ireland what Collins wanted. To achieve everything we can for Ireland and to protect democracy and the basic republican principles that underlay our constitution. When Collins took a decision he stuck to it. He knew who his enemies were and gave little credibility. The task of defending this state against those who have loyalty to another illegal constitution, must continue. It is our historic task. We will defend this republic against those who have attempted to overthrow this state since it was first established. To anything else would be to sell out on the legacy and the memory of Michael Collins.